When I first moved to the Las Vegas Valley, I enrolled in the Second City Las Vegas improv program. I made my first Vegas friends there, found an outlet for my curmudgeonly take on the world, and improved my skills. The highlight of my experience was a class called “Improv I” with instructor Paul Mattingly, a Kentucky native and former featured performer in the Second City’s show at the Flamingo. It was Mattingly who gave me the courage – and the skill – to improvise ridiculous roles: a obsequious flunky to an Oriental despot, for example, or a blind obstetrician servicing both sexes. Second City Las Vegas is gone now, but its spirit lives on at Improv-Vegas, which formed this summer and quickly became the headquarters for the city’s vibrant improv community. You’ll find Mattingly at Improv-Vegas now, too. He’s an instructor in its training program and a performer on its stage at the Onyx Theater. I recently caught up with him there, and we talked about the appeal of improvisation. Improv is good training for people with showbiz aspirations, Mattingly said, but it can be “life-changing” for civilians, too, both in everyday life and professionally. That’s because good improv depends on eye contact and emotional honesty – and so does good living. The comedy is just a bonus. “I can’t teach how to be funny, but I can teach how to be honest and open, and that’s when the real comedy comes,” Mattingly said. “When people try to be funny it’s painful.” That’s Mattingly – brutally honest and right on the money (turn on a TV sitcom if you need further proof). I sat in on one of Mattingly’s recent classes, and it was much as I remembered them. He began with exercises and mirror games to focus the group, then moved on to scenes. In one setup, participants had to produce a deep emotional exchange while limited to a vocabulary of just one word each. If you can convey the angst of factory layoffs by repeatedly saying “giraffe,” you’re doing it right. If not, Mattingly will let you know through constructive – and funny – critiques. Mattingly made Coca-Cola go up my nose even when he wasn’t trying to be funny, and the first 80 minutes of the three-hour class flew by in what seemed like half the time. I wasn’t the only one having a good time. Good-natured banter and appreciative laughter filled the stage, and often was heard an encouraging word. 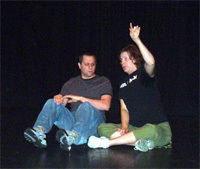 Mattingly remarked later that friendships thrive in the local improv community, which includes more than a hundred performers. Amy Pittle, president of Improv-Vegas, agreed, saying that one of the program’s greatest strengths is the “sense of family behind it.” Another is its ability to bring people out of their shells in a safe, supportive environment. Even for those not interested in comedy as a career, the classes help students to think on their feet and to put aside the worries of life for a while – kind of like hanging out at Cheers, but without the drunkenness and annoying waitresses. But friendship isn’t the goal, and neither is therapy. The goal is performance, and Improv-Vegas delivers that, too, providing a stage for its students, graduates and local performers at “The S.E.T.,” a comedy showcase held every Monday night at 9:30 p.m. at The Onyx Theater (inside The Rack, 953 E. Sahara Ave; enter at Commercial Center, then take the first left). Tickets are only $7 ($5 for enrolled students). That’s a lot of entertainment for seven dollars. At a recent S.E.T. performance, I was struck by the warmth and boisterousness of the crowd, which numbered more than 60 people. After the emcee opened with an homage to gay rodeo and the theme from “The Nanny,” the local troupe Gemini took the stage. I recognized one of the players from my own days as a student, and one of the performers was a student currently enrolled in Mattingly’s class; clearly, even relatively new actors feel comfortable appearing in the shows. As expected, they created comedy – good comedy, most of the time. The best scene evolved from an audience suggestion (“Trombone!”) into a scene of airport chaos as language barriers, a comically inept guard and buffoonish supervisors all conspired to create plausible apprehension that a musician’s instrument was a brass-plated automatic weapon. An homage to Paul Newman (“The Color of Salad Dressing”) was poignant and – well, no, it was just funny. If enjoying yourself on a journey of honest self-examination while meeting interesting people and making new friends sounds good to you, check out Improv-Vegas’ shows and classes. A new session of classes (including a comedy-writing course) begins November 2. A stand-up class, more writing courses and expanded corporate training are in the works for later this year or next. For more information, visit the Web site. Tell ’em I sent you, and prepare to duck the tomatoes. Interesting that you mention the eye contact thing. As new and different as my Groundlings classes were for me, the only thing that really felt unnatural was making eye contact. I didn’t realize how much I (and actually most people, as I’ve since noticed) avoid it in civilian life. Great article. If ever the film bug bites me again, Improv-Vegas will be my first casting stop!